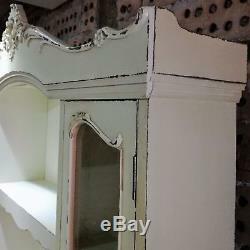 French Style Painted Glass Top Dresser Shabby Chic Vintage Distressed Antique Style. 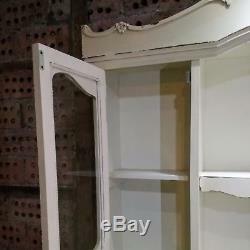 This delightful and dainty French styled painted shabby chic glass top dresser with 3 drawers is quite unique. 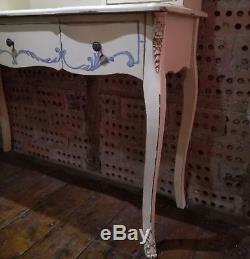 This is a 2 part dresser, the base unit is very shapely with beautifully carved and shaped legs with ormolu style carvings to the top and base of the front legs. 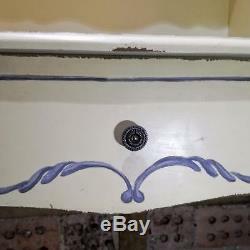 There are 3 shaped drawers with hand painted designs on the front and lined with grey fabric. 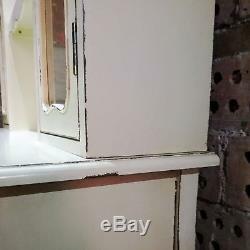 The top section of the dresser has 2 glass fronted cupboards with bronze type knobs and decorative curved shaped moulding around the glass panels. Inside the cupboards there are 2 fixed shelves. 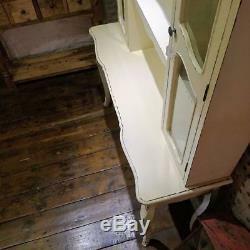 The centre section has 2 open shelves with a shaped front frieze. 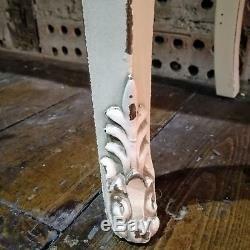 The top of the dresser has a highly decorative cornice with leaf and flower styled carvings. 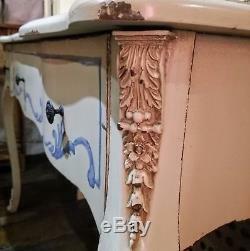 The dresser has a very much vintage distressed shabby chic paint finish. These pieces of Indian furniture are made from locally sourced wood, sometimes recycled, in some of the pieces a combination of MDF and ply may also be used. Overall: H 216cm (85") W 121.5cm (47.75") D 40cm (15.75). Top: H 135cm (53") W 117cm (46") D 22cm (8.75). Base: H 80.5cm (31.75") W 122cm (48") D40cm (15.75). Open shelf: W 57cm (22.5). Alternatively, if you prefer, you can arrange collection by your own courier or in person. 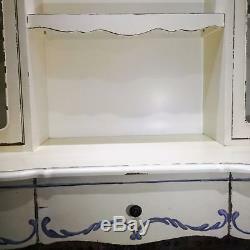 The item "French Antique Style Painted Glass Top Dresser Shabby Chic Vintage Distressed" is in sale since Thursday, July 20, 2017. 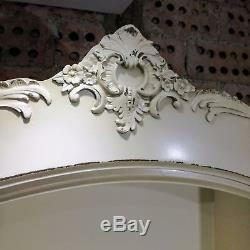 This item is in the category "Home, Furniture & DIY\Furniture\Cabinets & Cupboards". 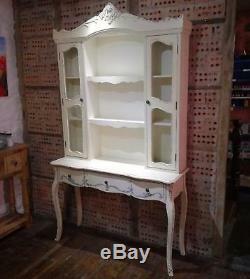 The seller is "fabiofabioworld" and is located in Haverfordwest, Pembrokeshire. This item can't be shipped, the buyer must pick up the item.